Nothing welcomes spring more than the annual egg hunt. Whether it’s a community, neighborhood or family hunt, food safety is of utmost importance. 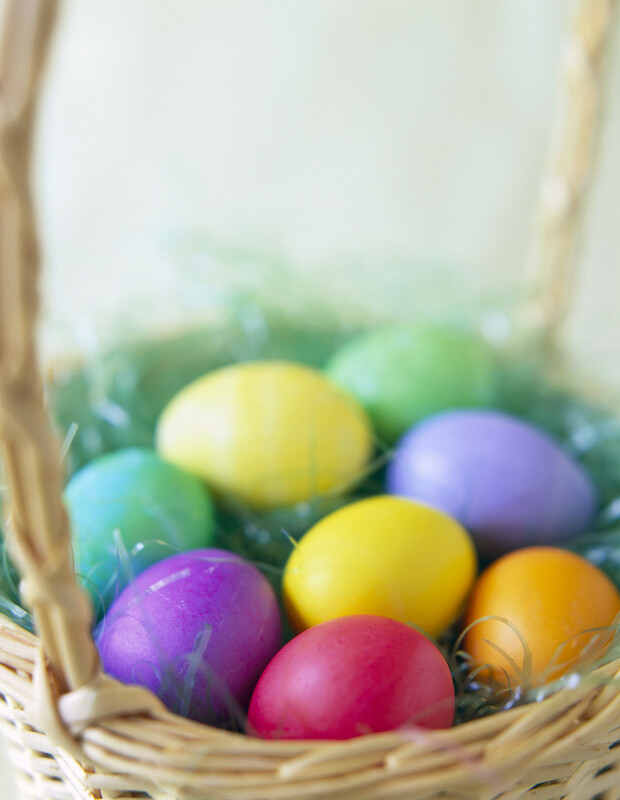 Follow these food safety guidelines to ensure your egg hunt is fun AND food safe. Before the hunt . . .
•	Wash your hands thoroughly before handling eggs at every step of preparation, including cooking, dyeing and hiding. •	Only use eggs that have been refrigerated and discard eggs that are cracked or dirty. •	When cooking, place a single layer of eggs in a saucepan. Add water to at least one inch above the eggs. Cover the pan, bring the water to a boil, and carefully remove the pan from the heat. Let the eggs stand (18 minutes for extra-large eggs, 15 for large, 12 for medium.) Immediately run cold water over the eggs. When the eggs are cool enough to handle, place them in an uncovered container in the refrigerator where they can air-dry. •	When decorating, be sure to use food grade dyes. Be careful not to crack the eggs, as bacteria can enter through those cracks into the egg itself. •	Keep hard-cooked Easter eggs refrigerated until just before the hunt. Keep them on a shelf inside the refrigerator, not in the refrigerator door. •	Consider buying one set of eggs for decorating and another set just for eating. During the hunt . . .
•	Hide the eggs in places that are protected from dirt, pets, and other potential sources of bacteria. •	To prevent bacterial growth, don’t let eggs sit in hiding places for more than two hours. After the hunt . 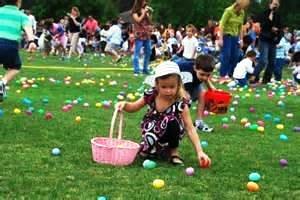 . .
•	Discard any eggs that were cracked, dirty or that children didn’t find within two hours. •	Place the eggs back in the refrigerator until it’s time to eat them. Food Safety Notebook, The Ohio State University Extension. We have waited patiently all winter long and spring is ALMOST here! There is anticipation for the birds returning from the south to greet us with a song, a warm breeze through the green grass, and a positive feeling is in the air. Along with spring comes the first holiday of the season – Easter. If we were playing Family Feud and were asked to list our top five responses to things associated with Easter, eggs would definitely be one. There are so many things we can do with eggs at Easter time. They can be hard boiled or the center blown out. They can be dyed, glittered, stenciled, and stickered. They can be used as a decoration, put in baskets, or used in an Easter egg hunt. What I am most interested in is egg safety at all stages of the Easter egg process. Always buy eggs from a refrigerated case. Choose eggs with clean, un–cracked shells. Take eggs straight home from the grocery store and refrigerate them right away. Check to be sure your refrigerator is set at 40°F or below. Don’t take eggs out of the carton to put them in the refrigerator –– the carton protects them. Keep the eggs in the coldest part of the refrigerator – not on the door. Don’t keep raw or cooked eggs out of the refrigerator for more than two hours. Start with 6 raw eggs. Make sure the eggs are clean and that none of them are cracked or broken. Place a single layer of eggs in the bottom of a pot. Fill the pot with water and make sure that the eggs have at least an inch of water above them. Cover the pot with a lid and place on the stove top with the heat on High. Let it boil for four minutes and then turn off the heat. Take the pot off the stove. With the lid still on, let the eggs sit for 15 – 17 minutes. Place the pot in the sink, take off lid, and fill with cold water. Let the eggs sit in the cold water until completely cool. Take the eggs out of the water and dry them off. They can now be decorated or peeled to eat. Once all of the eggs are hardboiled, cooled, and dried, it is time for decorations. Decorating eggs is a great time to bond with family and friends. There are thousands of different ways to decorate eggs. Personalize them for each person to make them feel special! Consider hiding places carefully. Avoid areas where the eggs might come into contact with pets, wild animals, birds, reptiles, insects or lawn chemicals. Make sure all the hidden eggs are found and then refrigerate them. Discard cracked eggs. If you are planning to use colored eggs as decorations, (for centerpieces, etc.) where the eggs will be out of refrigeration for many hours or several days, discard them after they have served their decorative purpose. Whatever you decide to do this Easter, make sure that you are using eggs safely. If you are planning to eat the Easter eggs keep in mind that they should not be out of refrigeration for more than two hours. Follow the above suggestions and you’ll have egg-xactly the Easter you were hoping for!